When Wilson purchased Mountain Mills in 1883, the mill had already been updated with a modern turbine. Turbines had replaced waterwheels as a power system by the 1850s because they were smaller, more efficient and powerful, and easier to maintain than a traditional waterwheel. They also cleared the way for the age of hydroelectricity. Water flowing over the escarpment at Decew Falls provided the energy to power Wilson’s mills. Water from the millpond was directed through a single penstock and discharged through a single turbine close to the bottom of the falls. The spinning turbine set all the machinery inside the mill into motion. 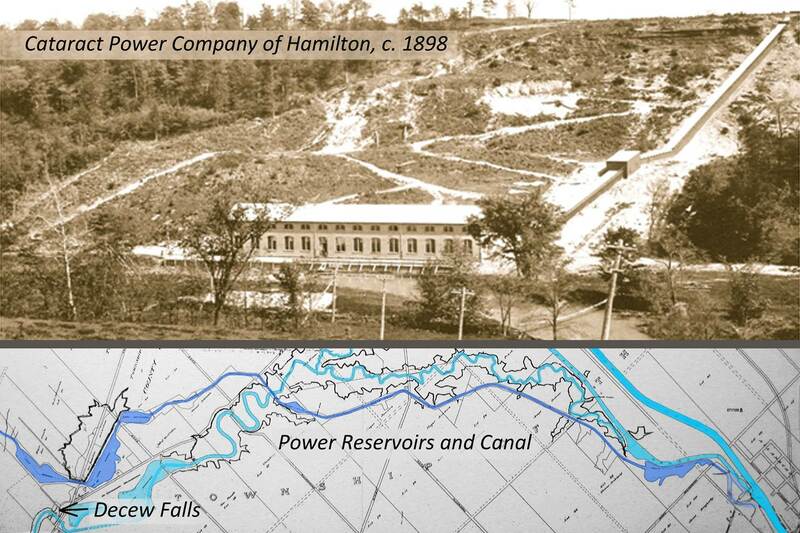 In 1898, the Cataract Power Company of Hamilton (now Ontario Power Generation) began generating and transmitting electricity from St. Catharines to Hamilton from a site within one kilometer of Wilson’s mill. At the time, 56 km was the longest distance that electricity had ever been transmitted in Canada, and the second longest distance in the world. The firm built the electrical power generating plant to the north of Morningstar Mill at Reynoldsville (now Power Glen) and used the same principles that Wilson did to run their plant: water from Lake Moodie was direct to a penstock and discharged through two turbines (in their case) at the bottom of the escarpment into Twelve Mile Creek. Even though Wilson and the Power Company used falling water in the same way, the difference in product was revolutionary and marked the end of 19th century technology and the beginning of 20th century technology in our area. In Wilson’s case, he used falling water to spin a turbine which produced about 25 kilowatts, but the power could only be transmitted locally over a few feet with shafts, gears, pulleys and belts. The power company used falling water to produce several thousand kilowatts that could be transmitted electrically over many kilometers. The electrical transmission of power now gave manufacturers the flexibility and freedom to locate their enterprises anywhere. This was extraordinary at the time, and vast fortunes were made. Not to be outdone by his neighbour, in about 1902 -1904, Wilson installed an electrical generator which ran off the turbine which powered his mill. For about 10 years until the Power Glen Station began providing electricity to the Decew Falls neighbourhood, Wilson produced 3 kilowatts of electrical power at 110 volts for lighting. Wilson’s daughter, Jessie, writes that her father ‘wired the house and mill himself… [he] would turn [the generator] on at dusk and off when he went to bed at night!’ Wilson, unlike his neighbour, did not make a fortune; however, the thrill of being able to turn on a light in the evening like people in the city did would have been something that Wilson’s daughters would have been very excited to tell people about!